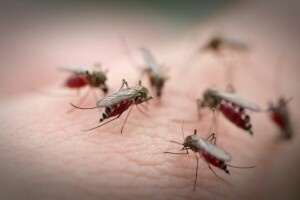 Researchers have adapted an existing diagnostic test for malaria to predict the dangerous complications that sometimes arise after the parasite is eradicated from patients’ blood. An estimated 3.2 billion people in 95 countries are at risk of malaria infection, and even though treatment with a class of drugs called artemisinins is associated with fatality rates lower than 5%, some patients receiving these agents develop severe anemia weeks after clearance of the parasite. Clinicians lack reliable methods to pinpoint which patients will experience widespread destruction of their red blood cells following therapy with the artemisinin artesunate — a condition called post-artesunate delayed hemolysis (PADH). Episodes of PADH have been linked with severe kidney failure, which is one reason why the World Health Organization has noted an urgent need for a simple and reliable test. Here, Papa Alioune Ndour and colleagues repurposed a diagnostic already in use — the BinaxNOW malaria kit — to predict PADH with 89% sensitivity and 73% specificity. The assay measures remnants of a malaria protein named HRP2 on red blood cells, and was successfully validated using diluted blood samples from 95 Bangladeshi patients and 53 French travelers, all of whom received artesunate. Notably, a separate cohort of 49 patients that were administered quinine (which is not associated with post-treatment anemia) did not have persistently high HRP2 levels. The authors say the accuracy of the test must be confirmed in larger-scale prospective studies, and may be preferable to current recommendations for mandatory 28-day monitoring of all malaria patients — to help high-risk patients achieve better post-treatment outcomes.